Fall Happy Hours Are Back! Celebrate with us on August 25th with discounts and swag from all our favorite brands! Coastal + Sanuk Sangria Happy Hour! JOIN US AT THE 8TH ANNIVERSARY OF THE WEST SEATTLE 5K RUN/WALK! Bundle up and Come down to Alki Saturday December 10th to watch and listen to the Christmas ships as they sail by the beach and stop and carol over the bonfires and sandy shore. Coastal will have Festive Sips to warm you up while you shop great Holiday deals! 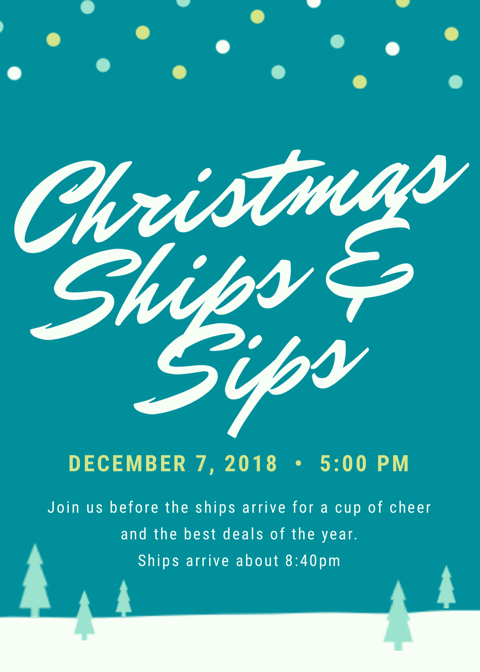 Holiday Happy Hour - Thursdays in December! Select drinks and deals each week at Coastal every Thursday in December. Coastal is proud to again be part of this fantastic fundraising Spring fashion show put on by the West Seattle non profit, Northwest Hope and Healing. Each week will be a different sale of current fall/winter fashion. Stop in the store from 4-6pm to sip n’ shop all your favorite brands!